Step by Step Thinking-Out-Loud Process of an Expert Test Taker. If you are anything like me, you keep Netflix, Hulu, Amazon, Pandora or some sort of background noise on 24/7. Step 1 is very simple and very effective. TURN OFF ALL DEVICES INCLUDING YOUR PHONE. Step 2. Open the exam prep book, choose a practice exam. You can start with the quizzes but I like to know where I stand before I read any chapters. Several exam prep books in the market segment their quizzes by sections. For example Mike Holt’s Electrical Exam Preparation segments their quizzes by the sections they are talking about in each chapter ie. Quiz #1 Straight Order Articles 90-110. Straight order meaning that the questions follow the NEC and aren’t too hard to find. In the Practice Exam, the questions are jumbled and cover Articles 90-Chapter 9. Taking this test first will cause my brain to warm up and start paying attention to my keywords. Realistically I don’t have 5 hours to sit for a practice exam but I can truly put 75 minutes aside after work and before dinner in a quiet environment. (No copyright disrespect to Mr. Holt. This question is straight out of his book “Electrical Exam Preparation Theory, Calculations, Code”. Unless overload protection is provided by other approved means, the minimum number of overload units required for a three-phase ac motor is_____________. Let’s play circle the possible keywords. Now we search for and flip over to T430.37 which is on page 334 but before you do anything else, you want to find the corresponding article to make sure there aren’t any “If’s, ands, or buts”. Now we can go back to the table and look for 3-phase which will give us answer C. If you notice, however, there is a star next to 3, one in each phase, you want to READ ALL THE NOTES on whatever tables you are using to answer questions. So we decided the answer is C and now there are some things you need to do while you study. Highlight Three Overload Units in the index AND highlight Motors art 430 in the index. Write page number on Motors Art 430 in the index. Highlight table 430.37 Overload Units and highlight Art 430.37. LEARN Article 430 = Motors. Step 4. Repeat the process until you finish the 25 questions (or if you are very determined all 100 questions). Step 5. Compare your answer to the Answer Key and grade yourself. Don’t give up if you missed any or all of them, this is exactly why you are studying now- months (hopefully MONTHS) before your exam. Once you get closer to the exam date and you test yourself for the last time, you will be much better at this. REMEMBER: These questions and other exam prep books in the market are only designed to HELP you LEARN the CODE BOOK…..These questions are not guaranteed to appear in your or anybody else’s exam. If you master this book, go find yourself another one or better yet, go online and find simulated exams. Last tip: Don’t get hung up on the questions. If you think they are incorrect or based on an older NEC book, so what? Do the best you can and move on, the point here is to learn the code book, practice finding keywords easily and practice finding the correct articles for the correct questions. This is basically how the majority of the theory and code questions are answered. We will talk later about calculations and formulas, since I am not an expert on these areas I will have one of our masters post a video blog about that. 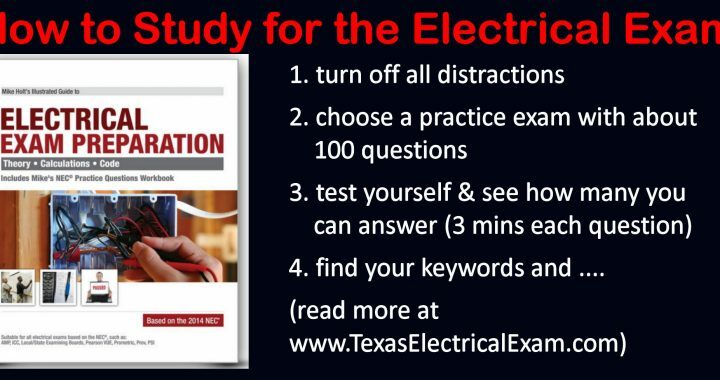 For now, if you have the Mike Holt’s “Electrical Exam Preparation” you can read Chapter 2. In chapter 2 you will have raceway and box calculations, conductor sizing and protection, voltage-drop calculations, motor and ac calculations, and dwelling unit calculations. Thanks for reading and share this page with all your friends! 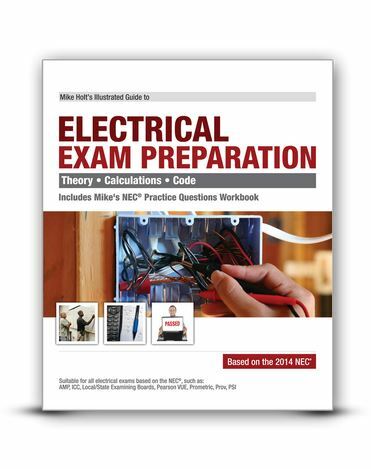 Posted in Exam prep and tagged 2011 nec test, 2014 nec code change, app for electricians, code book for electricians, code book index with page numbers, easy index for 2014 nec book, electric exam, electrical contractor license, electrical exam prep, local exam for electricians, master electrician, start electrical contractor.